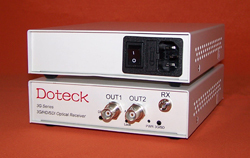 Doteck 3G series digital video fiber optic transmission system can transmit one 2970Mbps 3G-SDI super high definition digital video, or one 1485Mbps HD-SDI high definition digital video, or one 270Mbps SDI standard definition digital video or one DVB-ASI stream through one single mode fiber or multimode fiber with the standards of SMPTE424M, SMPTE292M, SMPTE259M, SMPTE297M, SMPTE305M, SMPTE310M. 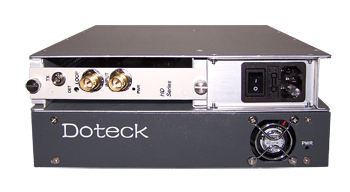 Doteck 3G series transmitter provides one 3G/HD/SD-SDI input, and one loop-through for local monitoring. The receiver outputs 2-way parallel 3G/HD/SD-SDI digital video. 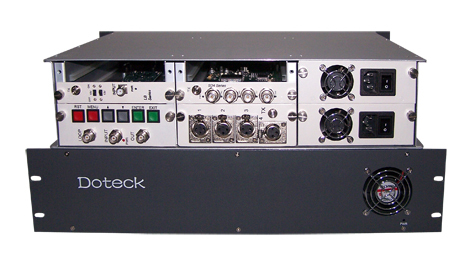 Doteck 3G series transmitter equipped with auto-cable equalization circuit, and cable driver circuit available at receiver. 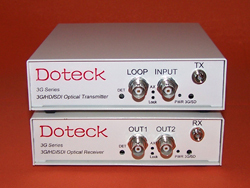 Doteck 3G series, both at the transmitter and receiver, signal jitter elimination circuit available, to ensure high quality signal transmission over long distance fiber cable. Doteck 3G series uses 3.3V power supply system, low power consumption.